Gutenberg Bible Leaf · Technohistory! 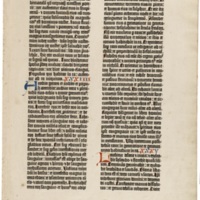 A leaf of the Biblia Latina, printed by Johannes Gutenberg around 1452. The text of the leaf is printed in two columns on each side of the page; it begins in chapter 33 of the Book of Isaiah, ending in mid-chapter 36. Presented by Cardinal Roger Mahony, archbishop of Los Angeles, to Loyola Marymount University President Robert B. Lawton, S.J. on 30 August 2009 (dedication of the William H. Hannon Library). 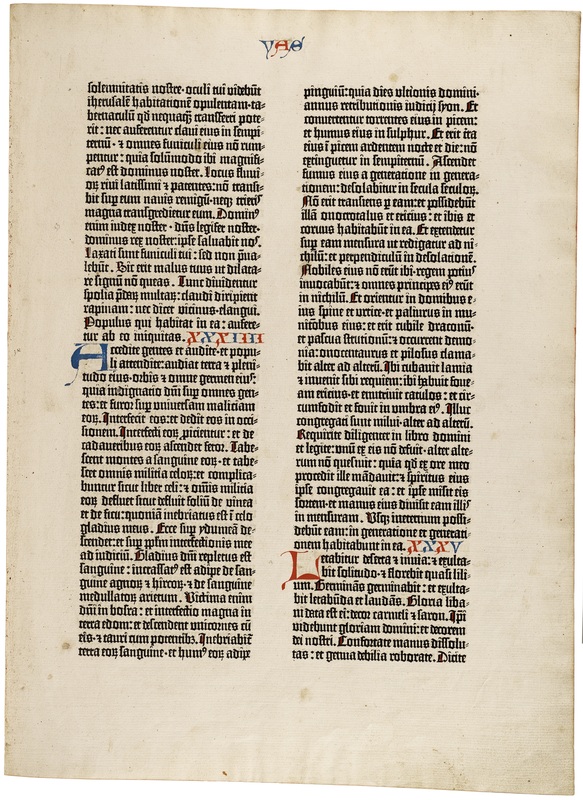 Johannes Gutenberg, “Gutenberg Bible Leaf,” Technohistory!, accessed April 26, 2019, http://technohistory2017.lmu.build/items/show/20.